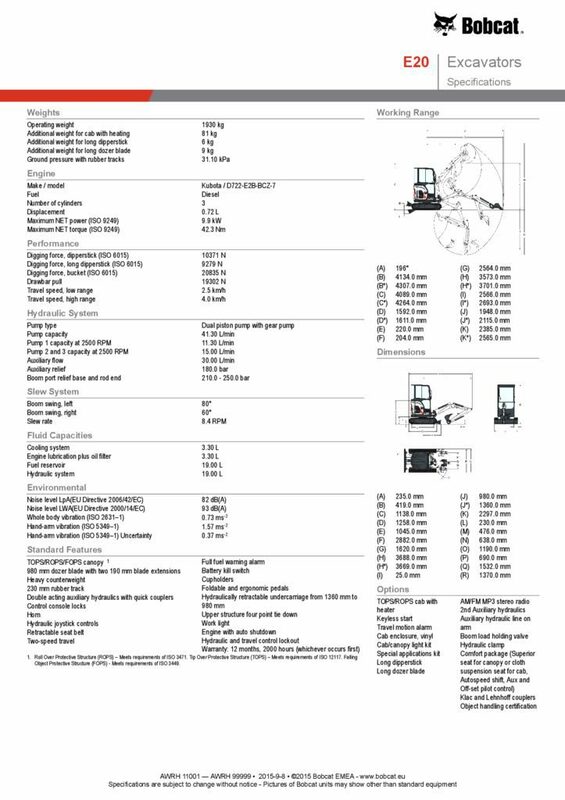 It’s a perfect balance: combining all the benefits of the ZHS (Zero House Swing) with the best performance (force and stability) of a 2-ton conventional tail excavator. 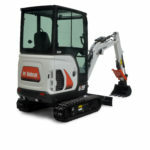 The retractable undercarriage reduces the E20’s width to less than 1 metre for working in confined areas. And the automatic swing brake, combined with the four tie-down points integrated into the upper-structure, make the E20 exceptionally easy and safe to transport. The best forces, combined with the best stability, enable you to perform any job. And if you need to be gentle, the smooth hydraulics provide you with precise control to perform fine tasks. In addition, the operator space is not only big but conformable, with excellent all-around visibility and easy access to all the controls in both canopy and cabin option. The tail is 100% casted, and all the side covers are made of thick steel. 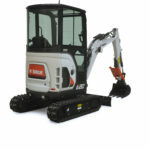 Add the oversized cylinders, and you begin to see the attention that has been paid to achieve superior durability in this excavator. The E20 can be configured to your particular requirements: heated cabin, long dipper-stick, long dozer blade, extra lights, suspension seat, auto shift, joystick-controlled auxiliary and offset functions, custom colour … anything you may need. 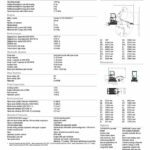 And a full range of Bobcat approved attachments – hydraulic clamp, breaker, auger, choice of quick couplers, buckets, and many more – allow you to get the most out of your excavator. By further protecting the front upper-structure corners turning within the swing circle, the Zero House Swing (ZHS) concept further enhances Zero Tail Swing (ZTS) functionality. ZHS functionality provides 320° of free rotation while working close to any object. With our E20 – with both canopy or cabin option – you get ZHS functionality without sacrificing operator comfort or performance. The E20 cab provides an uncompromised operator environment which, together with excellent visibility, provides the best possible operator comfort and safety. 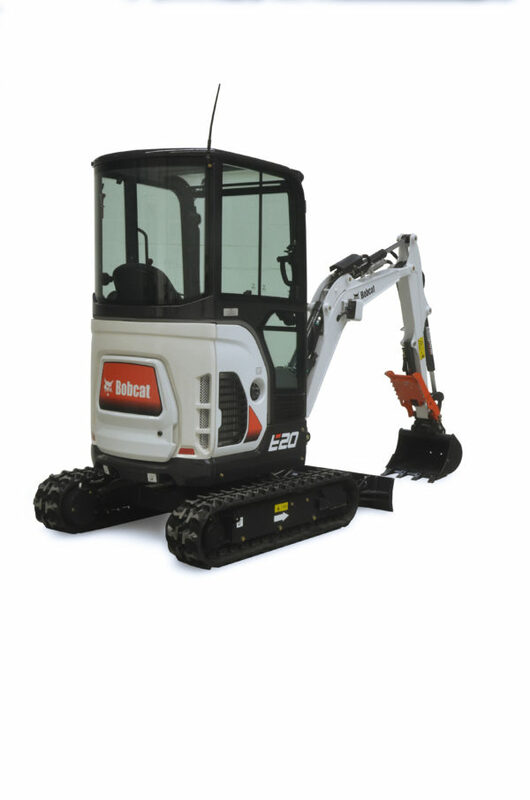 Highly durable materials make the Bobcat E20 hard-wearing and robust. The design features are tested under extreme conditions – and the ZHS concept, coupled with large casted tail counterweight and steel tailgate, ensure extra durability and peace of mind while working. 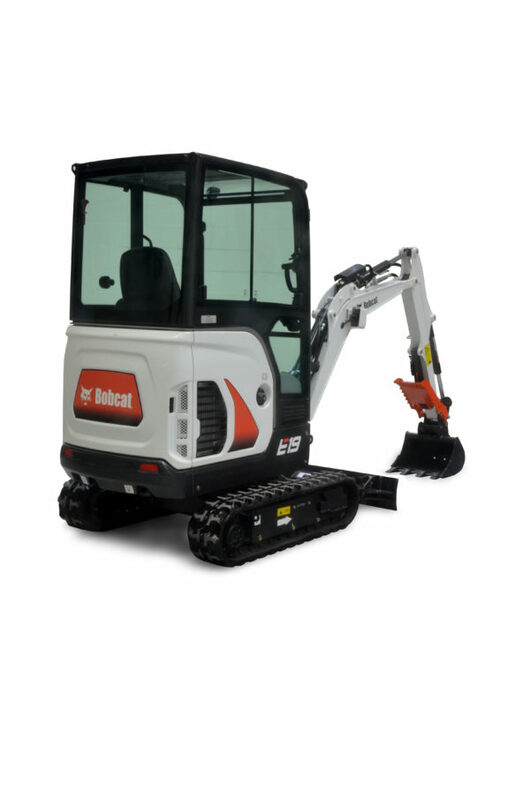 Bobcat’s unique E20 hydraulic system – combining variable piston pumps and gear pump – makes the best possible use of the engine power. Fast cycle times, combined with smooth control of class-leading breakout forces, provide maximum productivity. Boom and arm cylinder cushioning – unique in their class – enhance overall smoothness. With enhanced stability (which is at the same level as the best conventional machines in this weight category) and lifting capacity, combined with best-in-class proportional auxiliary flow, the E20 offers you the highest versatility in operating a wide range of attachments. Thanks to the largest tailgate in this category and openable side cover, all components for daily maintenance are easy to access, reducing downtime to a minimum.